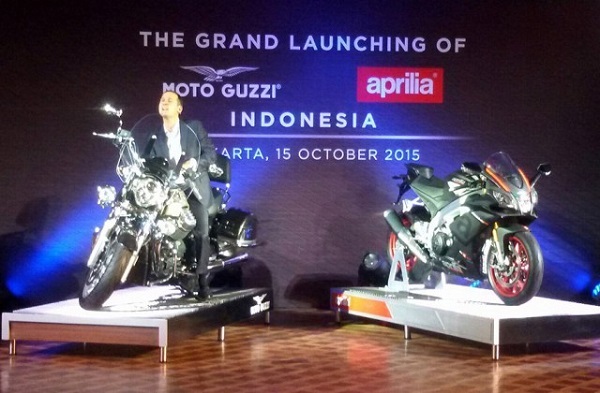 Hay Bro Sis...Two legends Iron Horse Italy, Aprilia and Moto Guzzi pave official in the country. Trafficked PT Piaggio Indonesia (PI), the second big bike brands (MOGE) is removed from Rp 357.1 million to $ 719.9 million. Aprilia range comes with two flagship models, Piaggio Indonesia RSV4 release RR Race Pack for USD 706.9 million, while the limited edition RSV RF Superpole cost Rp 719.9 million. Both prices are off the road. While the Moto Guzzi with its newest lineup of four, including a variant of the classic V7 Racer II priced at Rp 419.9 million and Rp 357.1 V7II Stone detachable million. For cruising models like Audace cost Rp 671 million, and the California Touring SE released Rp 711.4 million. All prices are offered off the road. "These products are made with the perfect combination of Italian style, the best skills, and high performance. Both of these brands are winners in their respective classes. PT Piaggio Indonesia also has prepared certified technicians who will help all owners of Aprilia and Moto Guzzi in Indonesia, "said Marco Noto La Diega as Managing Director of PI, Jakarta.